Ryan's Cleaning have been involved in the Ploughing Championships since 2001 so they're well versed in large crowds. 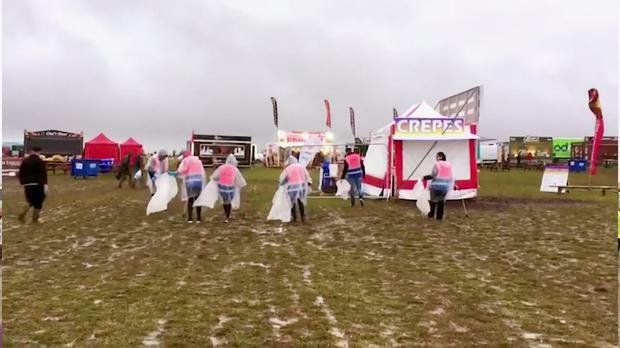 But as popularity of the annual event in Screggan, Co Offaly continues to grow, this Irish cleaning company has had to scale up its operations to meet the increased footfall. "To show the rise in footfall, on Tuesday we were at 115,000 in numbers attending in comparison to the 100,000 on the same day last year," Managing Director Elaine Ryan told independent.ie. "From our point of view it means that we need to be prepared for increasing footfall and increasing requirements from a waste disposal point of view. "We need ensure that we have enough offices on site to handle the increased numbers; 15,000 is a fair increase of footfall going through any site." The Tipperary couple behind Ireland's top contract cleaning firm for events have been working in the industry together for decades. When Pat and Philomena Ryan launched Ryans Cleaning in 1985, they weren't to foresee just how successful their professional service would become. From covering the Féile festival in the early 1990s, Ryans grew alongside the event industry as they perfectly filled a gap in the market as a firm who could manage large event cleaning operations. "There's 900 bins on site here at the moment so even to get them emptied on a daily basis is a big feat." In terms of employee numbers at the Ploughing event, Ryan's have roughly about 60 operational here on site, in addition to four site managers. "For a site this size you actually need those numbers for the vast area that needs to be covered," said Elaine. "And then you have the density of the crowds on the day, we spread our team across the entire site". Now the Ploughing Championships are over, Ryan's take on the after clean job over a two day period. "Our thing is to get in and out as quickly as possible so the farmer can have his site back as soon as possible," Elaine said. "For this to be effective, you're looking at around 100 operational staff each day so that the site can be back to its original state by Saturday". Ryans ensures that robust policies and procedures are in place and is externally accredited to four internationally recognised standards. For Ireland, the company reported a turnover of just over €3m last year, with Electric Picnic and the Ploughing Championships cited as their biggest events.